Discussion in 'Transformers Toy Discussion' started by mrhillz, Jul 15, 2010. 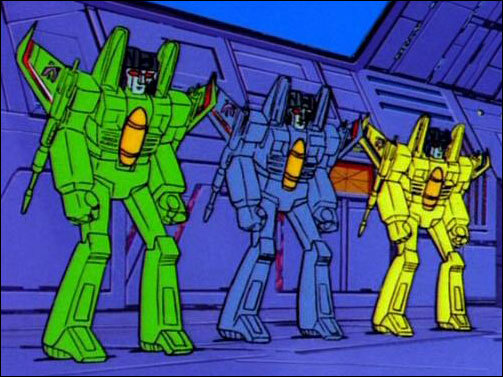 So, we know that the yellow one is Sunstorm, the green one is Acid Storm, but what about the blue one? Have they ever given him a name. The yellow Rainmaker isn't Sunstorm. Sunstorm is based on a seeker seen in the first episode. The only Rainmaker that has been named is Acid Storm. Darrel and his other brother Darrel. I'll honestly be surprised if he isn't named Hailstorm, since they recently picked up that name for a movie toy and it fits the "storm" theme. Name one of them Shitstorm, and I'll buy 100 of them. Who was only ever named via retcon. And for whatever reason given the e-hobby deco despite the guy with the flamethrower being far more prominent in the particular scene. They also were never named in the show. No individual names, no group name. "Rainmakers" is just an accepted fan-term, just like "Seeker" was until recently. "Acid Storm" was only named for the Universe'08 figure, which is supposedly to represent the green Rainmaker, despite the vastly different deco. I actually dont agree with the yellow rainmaker as Sunstorm. The color scheme doesnt match. In my eyes Sunstorm was the yellow seaker we saw in "More than meats the eyes"
I dub them Bluemoon and Yellowsnow. Hailstorm seems like it'd work for the Blue Rainmaker. Maybe Storm Surge for the yellow one? Acid Storm, Hailstorm, and Lemonstorm. For my purposes, Target Universe Dirge (Cybertron Starscream redeco) is now Hailstorm (AKA the blue guy), as there are three other more geewunny Dirge toys either available or incoming. P.S. 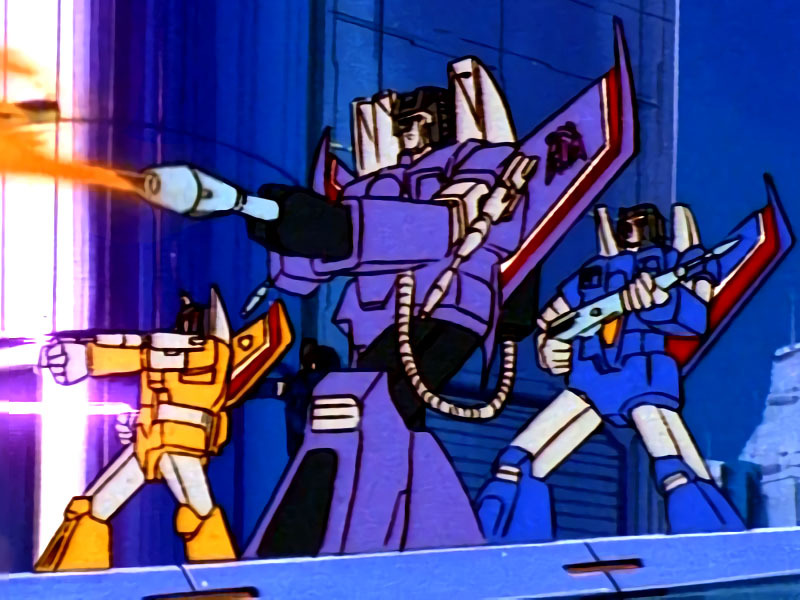 Looking at all the screenshots posted over this thread, it's too bad the purple flamethrower guy from MTMTE wasn't green instead, as that would probably fall under 'close enough' for many in favor of two separate 'rainmaker' appearances. In fact I'm declaring a retcon now! Purple guy got tired of being one of a faceless mass of purple guys who all look about the same, and took a dip in a vat of bright green paint. His pals in his unit were impressed with such brash action, and updated their paint accordingly, except without changing their base color. Some time later, after discovering his day-glow color made him a very shootable target, he adopted a more subdued camouflage scheme. Sunstorm, on the other hand, preferred fashion to practicality. So far, only the green one has a name: Acid Storm. The yellow one, I don't think that's Sunstorm despite the fact they're both the same color, but who can really say? As for the blue one, not named but maybe he's Hailstorm? And that purple Seeker with the flamethrower from More Than Meets the Eye Part 1... I would sure love to know who he is. EDIT: I sure hope that someday Hasbro will come out with the blue and yellow Rainmakers under the Generations line. Sunstorm is orange. The Rainmaker is yellow. Thats the same shade of yellow they used on Bumblebee. Certainly far different from the highlighter yellow used on the Rainmaker. The Sunstorm toy is orange. So I take it that seeker in MTMTE can't be him either. I say Hydro Storm and Solar Storm would be decent names for them. Though if they use acid rain aren't they ALL Acid Storm? The Sunstorm toy is orange. The paint mixing computer at Home Depot disagrees with you. According to that computer the pain on the Sunstorm toy is in the yellow family. Are we talking about the ehobby Sunstorm or every other release?